The LVK 10, 20, 30 series have been discontinued. Please see the LV Series as a possible alternative or contact our Flow Engineering department. 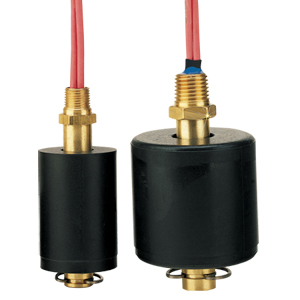 The LVK-20/30 Series level switches feature a small float displacement, especially suited for narrow or restricted areas. A standard 1 /8 " NPT male fitting for LVK-20 series allows for quick installation in either the top or bottom of the tank or vessel. LVK-30 has a 1/4" NPT. A sealed SPST switch provides consistent accuracy and high repeatability with the effects of shock, vacuum or vibration minimized. Extremely versatile, the switch is user selectable as normally open or normally closed by simply removing the retaining clip and inverting the position of the float. For intermediate float displacement, the LVK-20 Series will yield long life and greater stability for a broad range of level monitoring requirements. The LVK-30 Series larger float displacement is intended for use with liquids of high viscosity, and is well suited for harsh environments. Both models share the standard features. The float is made from Buna-N and the stem is either stainless steel or brass.